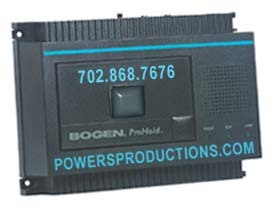 Bogen ProHold Digital Player -- Includes the PRO4, PRO8, PRO12, PRO16). The superior audio quality of the ProHold provides the ultimate professional image. It has a specialized audio circuit that eliminates silent passages, automatic one-step downloading from tape to digital memory, and one-play trigger for special applications.